Whether you’re seeking pain relief or want to enjoy optimal health through wellness care, discover the difference that chiropractic can make. Our goal is to deliver the best quality health care possible to our patients while treating everyone like family. Custom orthotics work on your feet much like glasses work on your eyes – they reduce stress and strain on your body by bringing your feet back into proper alignment. The plastic body of the custom orthotic helps to re-align the foot by redirecting and reducing certain motion that takes place during the gait cycle. Custom orthotics fit into your shoes as comfortably as an insole – and they have the advantage of having been made from precise imprints of your feet. 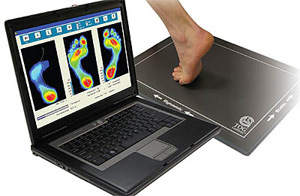 The GaitScan is an innovative diagnostic tool. The GaitScan is an innovative diagnostic tool and digital casting device that allows practitioners to analyze patient biomechanics and order custom orthotic products. With 4096 sensors and a scan rate of 300 frames per second, GaitScan is the industry leader in dynamic scanning capabilities.After completion of the scan, certified technicians utilize the data provided to make a custom orthotic designed specifically for you to correct your biomechanical issue and relieve that pain you may be experiencing. By use of either a foam impression or a resin based slipper sock an effective mold of the foot can be taken with both giving an anatomical representation of your foot in a neutral position. This then will assist in helping to make the custom orthotic to ensure you receive the best product for your condition. Many of the top providers do cover custom orthotics either in full or partial coverage. Each plan is different so make sure you look into your plan and let us know how we can help ensure you have met all requirements for being able to be reimbursed for your orthotic. Sound interesting? Contact us now to schedule an appointment!